Twist three different colored ropes of dough to form these cookies. 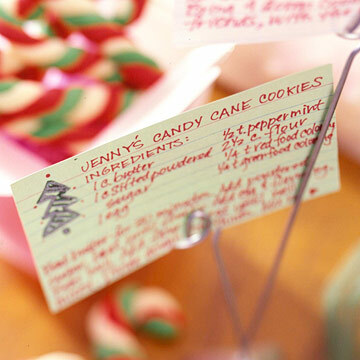 Flavored with a touch of peppermint or cinnamon, they fit right in with any holiday menu. In mixing bowl, beat butter 30 seconds. Add powdered sugar. Beat until combined, scraping sides of bowl often. Beat in egg and peppermint extract or cinnamon oil. Beat in as much of the flour as you can with the mixer. Stir in remaining flour. Divide into thirds. Knead red food coloring into one portion of the dough. Knead green food coloring into another portion. Leave the remaining dough plain. Cover and chill dough 30 minutes or until easy to handle. To make candy canes, on a lightly floured surface, shape a 3/4-inch ball of the plain cookie dough into a 5-inch rope. Repeat with a 3/4-inch ball of red cookie dough and one of green dough. Place the ropes side by side and twist together. Pinch ends to seal. Form into a cane shape. Place 2 inches apart on an ungreased cookie sheet. Bake in a 375 degree F oven 8 to 10 minutes or until edges are lightly browned. Cool on a wire rack. Makes about 36 cookies.